Archive for the ‘Lying’ Category. Teachable Moment: …Pants on Fire? 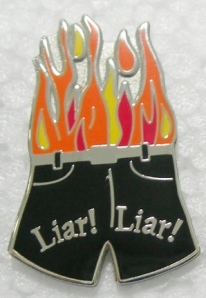 What to do when you catch your child as a liar, liar, pants on fire? “Ah ha! That’s getting to the heart of things,” Wendy thought! She grabbed Parenting with Scripture, went to the topic of honesty, and found Luke 16:10. “Whoever can be trusted with very little can also be trusted with much, and whoever is dishonest with very little will also be dishonest with much.” This turned into a wonderfully positive discussion about how Jessica could regain trust. What a great snapshot of positive parenting through a teachable moment!